AJ Styles, the WWE Champion, The Face That Runs the Place, will this year be subject to his first-ever WWE DVD and today WrestlingDVDNetwork.com gives you an exclusive first look! Click here to pre-order the “AJ Styles – Most Phenomenal Matches” DVD. The content listing is being finalized as we speak and early indications are to expect around 20 matches over a 3-disc collection that runs close to 8 hours and 45 minutes. Watch the “Phenomenal” new trailer right now! It’s time to add another WWE DVD to your collection! Money in the Bank 2018 officially releases today to fans across the United States. Let’s take a look at the 2-disc set and everything on it. Get hold of your own copy right now by clicking here to Amazon.com. 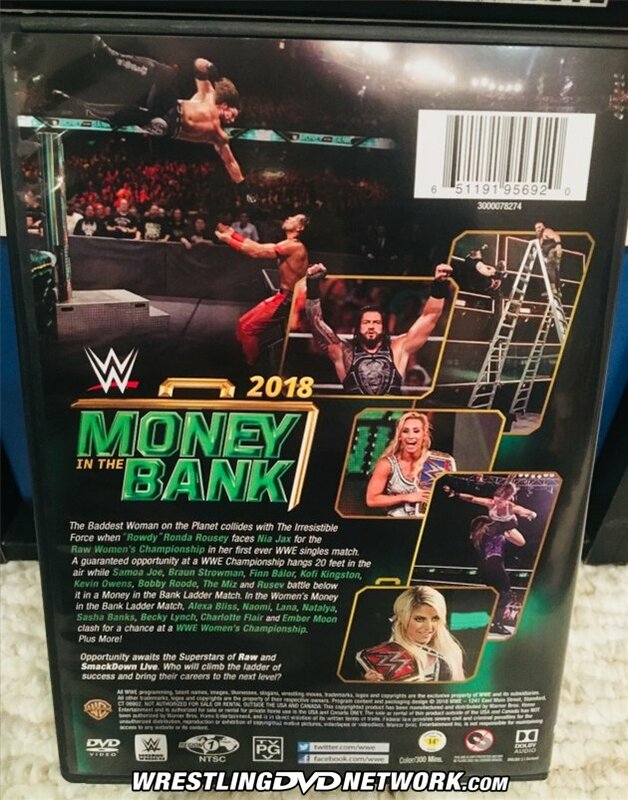 This year’s MITB Pay-Per-View saw Alexa Bliss capture the briefcase in a women’s Money in the Bank Ladder Match and Braun Strowman become the Monster in the Bank in the traditional men’s Money in the Bank Ladder Match. The event played host to Ronda Rousey’s singles match debut against Nia Jax for the RAW Women’s Championship and the continuation of AJ Styles and Shinsuke Nakamura’s rivalry in a Last Man Standing Match for the WWE Championship. 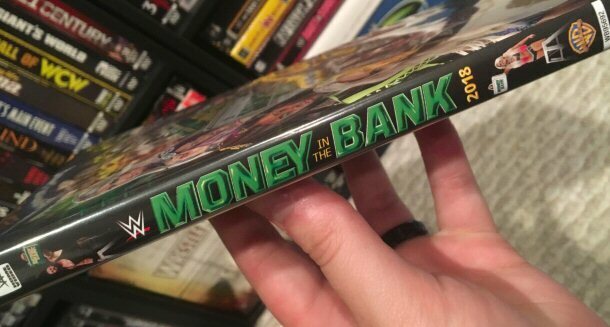 The Money in the Bank 2018 DVD presents the entire 4-hour PPV event and 6 extra features! Thanks goes out WDN readers Matthew and Jordan for the first look photos. The Baddest Woman on the Planet collides with The Irresistible Force when “Rowdy” Ronda Rousey faces Nia Jax for the RAW Women’s Championship in her first ever WWE singles match. A guaranteed opportunity at a WWE Championship hangs 20 feet in the air while Samoa Joe, Braun Strowman, Finn Bálor, Kofi Kingston, Kevin Owens, Bobby Roode, The Miz and Rusev battle below it in a Money in the Bank Ladder Match. In the Women’s Money in the Bank Ladder Match, Alexa Bliss, Naomi, Lana, Natalya, Sasha Banks, Becky Lynch, Charlotte Flair and Ember Moon clash for a chance at a WWE Women’s Championship. Plus more! Opportunity awaits the Superstars of Raw and SmackDown Live. Who will climb the ladder of success and bring their careers to the next level? Match and two segments from the Kickoff Show, plus a match and two segments from RAW and SmackDown Live episodes aired in the run up to Money in the Bank – extras list. And a free Charlotte Flair trading card inside the packaging! – United States: RIGHT NOW! 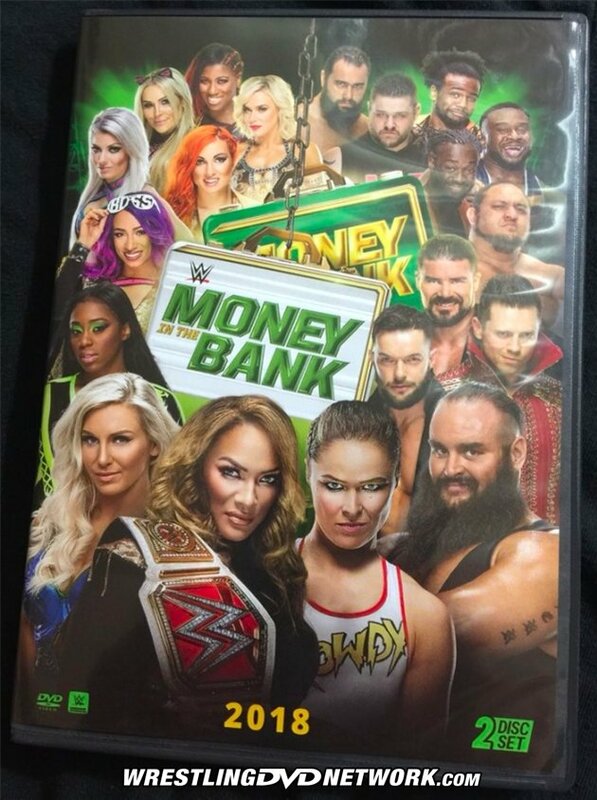 Grab a copy of the MITB DVD here on Amazon.com. – UK/Europe: August 6th. Get your Money in the Bank DVD on pre-order at Amazon.co.uk. – Australia: August 15th. Pre-order your copy of the MITB DVD on Madman.com.au. Next up we’re bringing you a look at the full sleeve artwork for “Shawn Michaels: The Showstopper Unreleased”; a 3-disc DVD set to be packed with more than 8 hours of rare HBK matches. This will be WWE’s big Home Video release in October. WWE posted this video teaser on Twitter hyping the “The Shield: Justice For All”. The Shield’s new WWE DVD is available now in both the USA ($19.96; Amazon.com) and the UK (£24.99; Amazon.co.uk). EBAY WATCH: This massive lot of 100 WWE PPV DVDs (among them some WWF DVD rarities like SummerSlam 2000, Judgment Day 2001 and No Mercy 2001) is being auctioned off on eBay today, ending in just a few hours. The current bid price is $20.50. If you don’t meet the reserve price on those how about this lot of 10 ROH DVDs ending tomorrow? Or maybe this collection of original-print ECW DVDs ending Friday? in that context I was very disappointed about the Fremantle customer service. while I assume they get that question a lot I wrote them about 1 1/2 weeks ago asking if there was ANY chance of a bluray release for the upcoming AJ Styles compilation. and yes, I wasn’t “demanding” or otherwise not polite. and yet I still haven’t heard anything back from them. they literally didn’t bother with answering. to me, that’s very poor service (even somewhat “standard” answer would be preferable to that). Either that or they’re just busy processing actual orders from paying customers. Hate to complain but I feel a little deflated looking at the complete match listing. Was hoping for a WCW and early WWE tryout match just to tell a bit of backstory. I know they wouldn’t be “Phenomenal” matches as such, but still. Maybe they’re saving them for a doc set. I also don’t think two Reigns matches were needed; probably not even two Nakamura matches. They could’ve just picked whichever they thought to be the best of their respective series’. 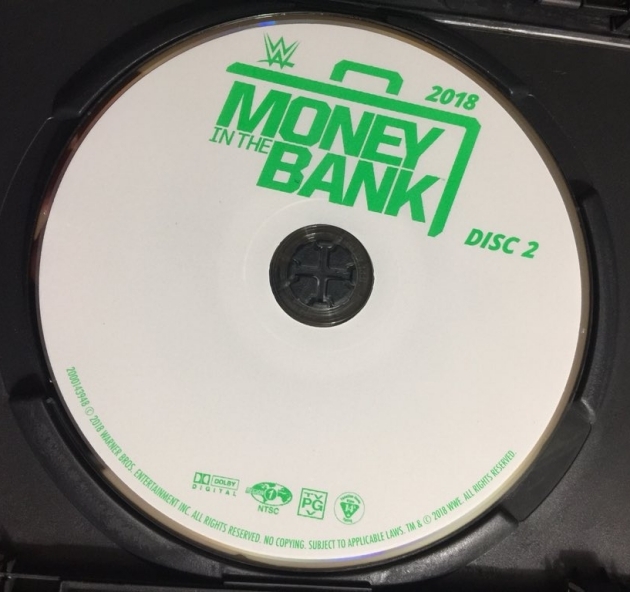 Really weird they can’t use a regular 2 disc case for the MITB DVD. I’m pretty sure Fremantle does that. All the double packs I have from them are regular 2 disc cases. It probably saves them a minute amount in production costs to have those big holes in the box and use less plastic. Warner Brothers do seem to be being a bit cheap at the moment. I’ve noticed most of their movie/TV disc labels in the UK (like the Big Bang Theory sets) have been printed in black and white for the past few years. Yes, definitely a cost cutting measure. I used work a bit for a record label many years ago, and we usually had the discs for CDs in black and white, as it was cheaper than doing them in colour. Any tna footage in this aj styles DVD? The WM34 match was good but prefer the MITB match instead though both could end up being included which is all fine with me. I rather they waited to release the set till a match vs heel Randy Orton, 100% Jeff Hardy, Samoa Joe, Daniel Bryan and Seth Rollins happened, I mean a ppv match with appropriate time, no interference, etc. We all know what Jeff Hardy can do, what heel Orton is all about, what AJ & Bryan are capable of and this has been as least as far as RAW superstars go Rollins year. So those 1on 1 matches imo are inevitable barring anyone getting released or too drugged up (Jeff Hardy 2011) to perform to their capabilities. I understand it’s for marketing purposes but really not a fan of “early sets” on talent who while they’v been wrestling for years have only been in WWE less than 5 years. This is especially when you consider they should fully focus on Unreleased sets on talent and eras/years as well as do sets on talent that have been wrestling for WWE for YEARS and haven’t got a set, a doc/proper doc on them yet. Rick Rude, Sting, Angle, Orton, Kane, Taker are just some names that come to mind. Taker I can definitely see a (hopefully proper career spanning retrospective) doc with appropriate length unlike the short docs we see nowadays bc he’s one of if not the most fan requested for a doc set happening after his official retirement/HOF induction. Same for Kane I’d imagine. WWE could probably release a new AJ compilation every 12-15 months and each one would be can’t miss, and still have great matches left out. It is a business though. If they believe an AJ set will sell, which it probably will, by the bucketload, then of course they will release it now. Anan, based on your logic that a wrestler needs 5 years in order to get a home video release, you would’ve really hated the 1980’s. Hogan got his first release in 1985(only a year after returning to the WWF) and then had another release every year for the next 7 years. And there were a lot of other wrestlers who had a release after only being in the company for only a couple of years. To me it doesn’t matter how long someone has been around, what matters is if there’s enough quality content to fill up a release. And AJ has had more than enough quality matches so far.